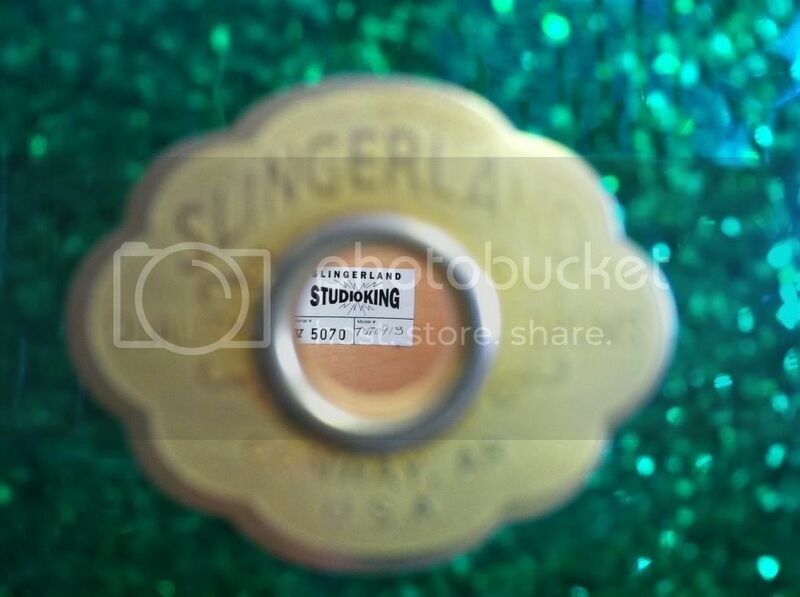 Who knows Slingerland? What era are these? They look modern but with a retro badge.... They were mentioned by Premier Carl oddly enough about the time I was standing in Music Brokers looking at them. Store clerk there said they were $3750 at another (mostly guitar) shop in town that I refuse to patronize. Current price is $2000. Sizes look to be 10,12,16 and 22 with a standard size snare. Just shell pack and tom stand included. BD is virgin. Are they as awesome as they look? Cuz they look awesome!! Here are the things I can tell you at the moment, with my brain trying to go to sleep on me. More people will chime in with more info I'm sure, and I might be able to do better tomorrow. Slingerland Nashville and Conway are the Gibson-owned versions, designed by Sam Bacco and Pat Foley. I own a set of the Nashville drums and have had the opportunity to play or inspect several other sets of both Nashville and Conway drums. The move to Conway (a Baldwin piano factory) meant no more involvement from either Sam or Pat, and the quality of the product became questionable. I know guys here who have Conway drums with no problems, but I've seen many that did have problems so I recommend checking them over closely. 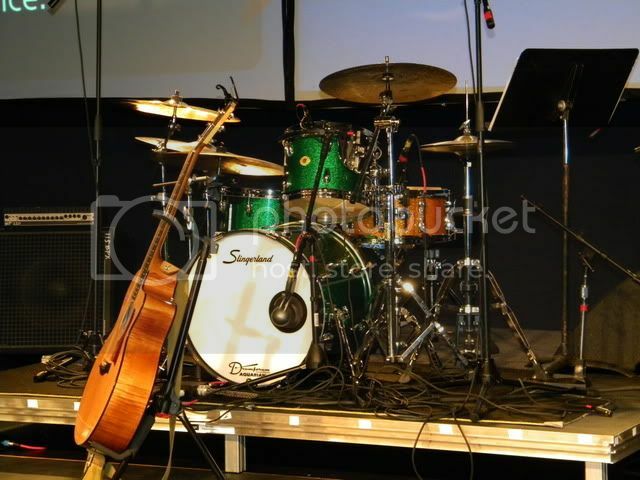 I would ALMOST consider going after the drums in the photo myself as I am looking for a 16 and 22 for my kit - but my kit is green sparkle and these look to be glass glitter! How odd. The Nashville Studio Kings are my favorite kit and have outlasted many others in my stable. I will never sell them. Pretty sure those are green sparkle, Jeremy. Glass pops more under light. Either way-$2k just to acquire a floor tom is excessive. I could easily build you a 16 to match your kit-just wouldn't have a badge. They are Keller shells. I built a 12x8 for a friend who has a Studio King kit. He loves it. The only parts that are hard to come by are the floor tom leg brackets and the actual die cast hoops they used. My buddy ended up switching his entire kit to stick savers, and it really opened up the sound of his kit. A lot. Very nice sounding drums, for sure. Yep. i'm a recent new owner of a Studio King, Nashville kit and I am sold on them. Just a beautiful looking, and sounding kit. They're making me re-evaluate my thoughts on some of my vintage player kits. Everyone that sees my drums feels the same way. If you've got the cash, I'd say get them. I also have a set of the nashville drums that I'm very impressed with (coincidentally mine are also green sparkle and i'm also hoping to someday find a matching 16" floor tom to compliment my 14x14). Quality-wise the Nashville built drums appear to have the edge over the Conways although I've seen some Conway drums that looked pretty nice (although many do appear to have issues with the wrap seams lifting for some reason). These drums were very expensive when new which probably contributed mightily to their apparent low sales figures. Also, I suppose due to the connection with Gibson, they tended to be available from full line music stores or guitar stores rather than in dedicated drum stores. great drums...but I'm not spending $2K to get a floor tom...and I do think that set looks like glass glitter, whereas mine are sparkle. Wow, that is a lot of coin for a used Keller-shelled kit. I love Slingerlands, but I think you could find something that sounds just as good for less. Chunkaway - I agree. I don't see why these deserve 2k asking price? What makes these sound better than any other keller shell kit? Is it the hoops, edges? For $2000 one could find themselves a used Nashville kit in good condition (actually, for perhaps less than that). The Conway kits do have the wrap as well as other QC issues, plus their resale value is pretty crappy based on the general perception of not being up to the same standards as the Nashville drums (once as product gets a rep for bad quality this rep usually does not ever improve over time, if anything, left unchallenged, the negative perception only spreads and deepens, regardless of whether or not such is in proportion with reality, as the recent controversy around a certain Canadian drum maker would attest). The back story on the Conway drums was that Gibson forced their dealers to order kits (regardless of whether said dealers normally sold drums) as part of their yearly dealership requirement. 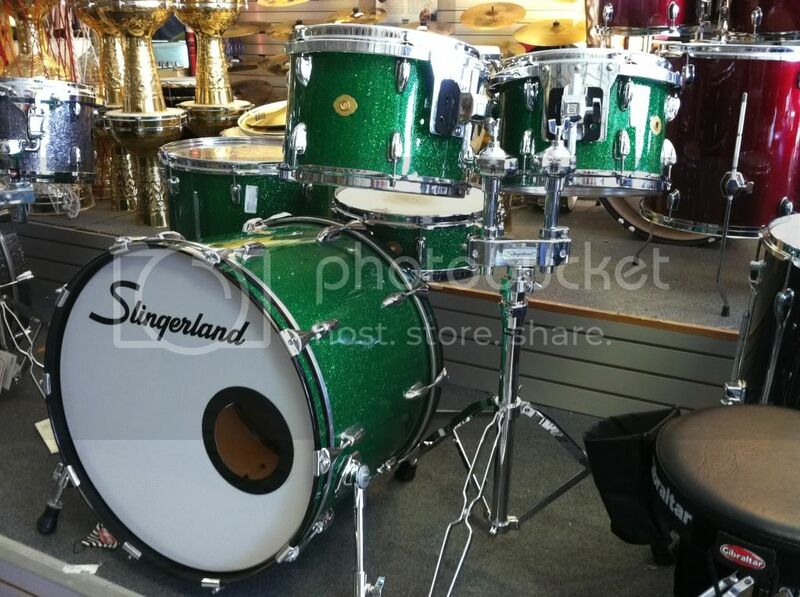 The latest incarnation of Slingerland coincided with a shrinking economy so the market for high-end kits wasn't there when the drums finally hit stores. Some dealers ended up selling the Conway drums at cost, or in some instances, below cost, just to get them off their floors. Not saying that this particular kit is a turkey, just proceed with both eyes open. 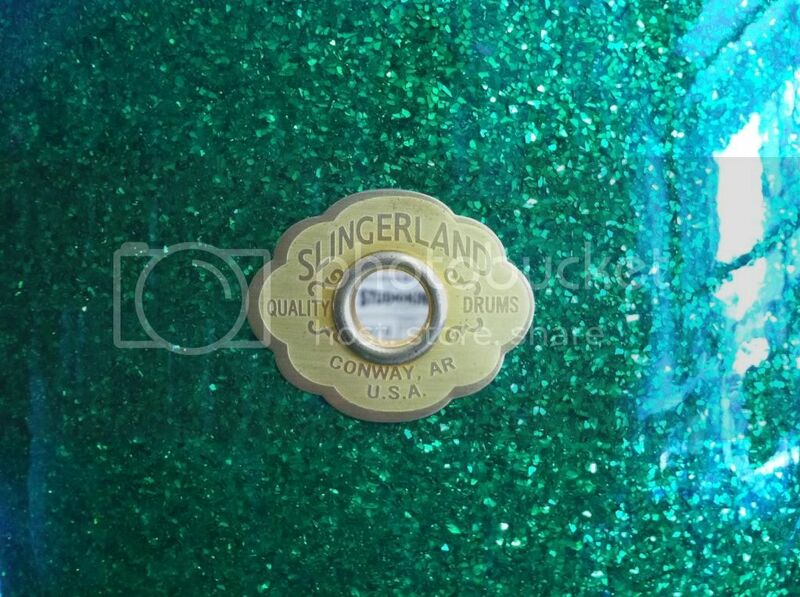 Okay guys I need some education regarding Slingerland shells, hardware & I hope someone here knows the story. 2. When Gretsch bought Slingerland 1989? )didn't they get all machinery to build the Slingerland shells and hardware (lugs) from Niles? 3. When Gibson bought Slingerland did Gretsch sell them any of the machinery to actually manufacture the drums or did Gibson only receive the intellectual property "Slingerland"? 4. Since the way I read things here Keller makes drum shells for everyone, couldn't I build a "Slingerland" drum kit in theory and just not name it Slingerland using Ego or someone elses "like" lug, etc.? 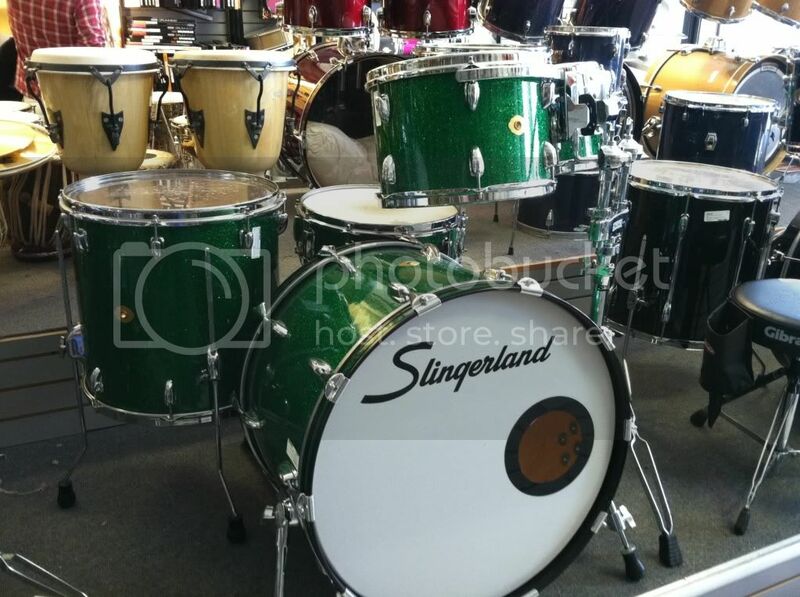 Slingerland did make their own shells in Niles (and Chicago prior to that). The shell making machinery went to Gretsch along with everything else but I don't believe Gretsch ever used it to make shells since they outsource their own shells. Some of the molds and machines even ended up for sale on ebay. By the time Gibson bought Slingerland I'm pretty sure they were mostly just buying the name and intellectual properties (and Gretsch kept Leedy wich they had acquired as part of Slingerland). The Gibsons are Keller shelled drums but, the Nashville drums at least, were made to very high standards. You can buy Slingerland style lugs from most of the suppliers as well as stick saver style hoops so it would not be hard to "clone" similar looking drums. I suppose they would lack the Slingerland "pedigree" that the official drums have...for what that's worth...but then again if you open that Pandora's box then there are a lot of drums being made carrying major names from the past and having little other connection. All I can say is I'm VERY happy with my Studio Kings. I'd compare them very favorably to my Gretsch USA Customs. KO es correcto - Gretsch had all the equipment but none of it was ever used by Gibson. The Studio Kings of Nashville and Conway eras were using Keller shells with Slingerland hardware, finish and edge designs from Foley and Bacco. It is possible to clone the drums today, and can be a whole lot more affordable and better made than buying a leftover Conway kit if you have the right guy do it. The Nashville drums are just IT though. That's my first choice. Not to hi-jack the OP kit that he's looking at, but did you guys all notice the Nashville kit that hit ebay today? I think it's a BIN of $1700. It's a nice looking kit. Got a link? I can't find it. 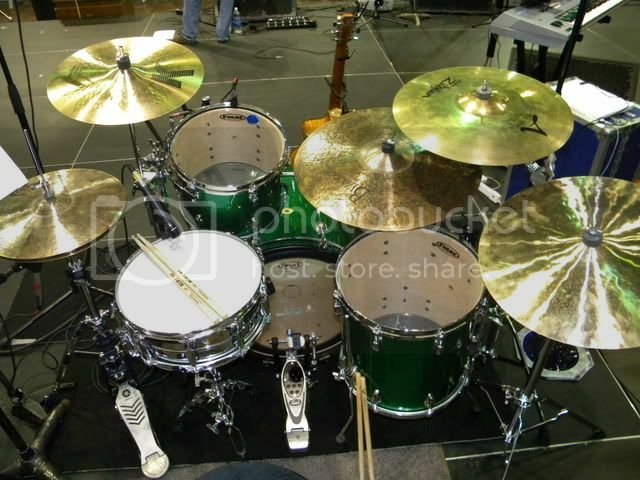 I see this one with a BIN of $1900, nice drums that have been relisted a few times already. But I didn't see any at $1700. That's them....typo...yeah, they've been on there before, but I think the entry point is lowered with the $1400 entry bid. EDIT: D'OH! I'll read before I post next time. This is the kind of info I was hoping for.... I'll pass on these and look for another opportunity. They sure do look sweet though, and the cloud badges are very cool! Just to close it out...I'm with all you guys that are saying..."what's the big deal, it's just keller shells" and "i could build them myself for a lot less". I totally thought that as well...until my kit showed up in my local GC and I actually tapped on them. Darn it, if they didn't sound amazing with Pinstripes on them. i don't know what, if anything is different about these vs. any other Keller shelled drums, but they sure are nice sounding to me. I don't regret the $$ I spent on them at all. In fact, it's making me look at some of my vintage players a bit different. I might try to move a few older kits as I can't see myself playing them with these in the house. The Nashville Slingerland drums were really great sounding drums. Credit to Sam Bacco and Patrick Foley. great drum builders. Keller shells are great with the right edges and the Slingerland stick saver hoops. Special drums.